With every great bro comes a great arsenal. Let’s take a look at part of Dudebro’s. This is one of Dudebro’s primary weapons, the Razor Blood. 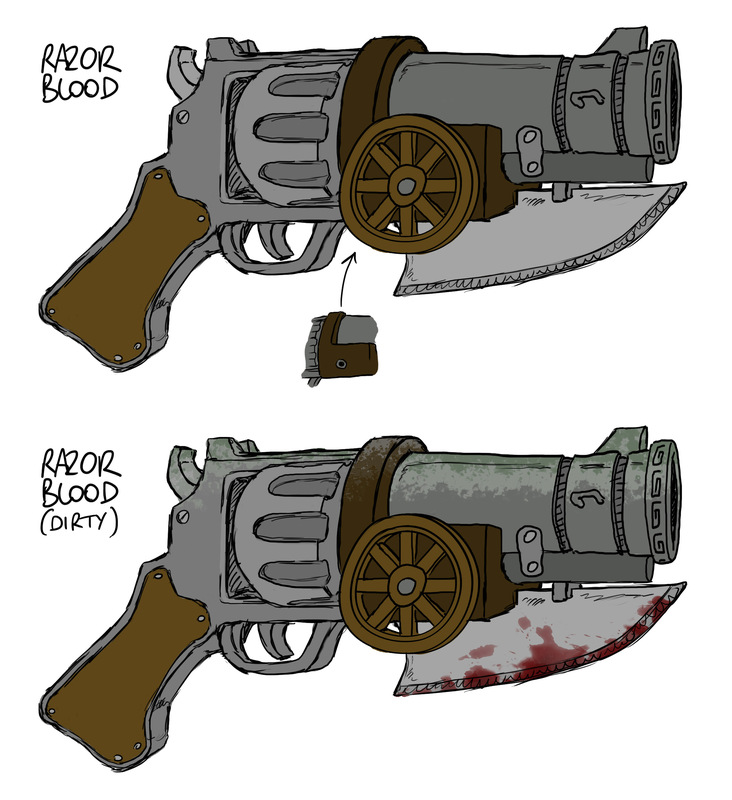 As you can see, the base design is that of a revolver but with one notable exception: the barrel. It has been replaced with a compact cannon, making this weapon a literal “hand cannon” that shoots miniature cannonballs. The inclusion of a bayonet in the design is a purely aesthetic choice and would be troublesome to use in close-quarters combat. There also seems to always be ammo in the chamber, a feature that even the designers of the gun can’t explain. In addition to being used by Dudebro, it is also the standard-issue firearm of the SkullPro army. However, the soldiers have a habit of using the bayonet as a razor, dulling the blade in the process. Because of this, Dudebro’s model looks much nicer. Despite the unlimited ammo and noticeably powerful bullets, it is still the weakest weapon in Dudebro’s arsenal. There are definitely more desirable options. But in the right hands, it can be a deadly tool that’s useful to wear down the enemy. This entry was posted on Monday, July 5th, 2010 at 7:00 am	and is filed under Main News.